"Superbly readable... It will stand as the premier work on the subject for a long time." "A masterful blend of military and social history that should be read by everyone." "A book of unusual merit." This is the third of Kathleen's six books about the American Civil War. It is her first non-fiction history, and took 12 years to research and write. This book is written for adults and mature teens, especially those who enjoy reading about the experiences of ordinary people caught up in extraordinary events during the war between the states. Historians identify the battle of Antietam (Sharpsburg), which unfolded on September 17, 1862, as “the bloodiest day in American History.” By best counts, more than 23,000 men were dead, wounded, or missing by nightfall. And left in the smoldering aftermath were the children, women, and men who made their homes in the village of Sharpsburg and on surrounding farms. The soldiers who participated in the 1862 campaign did so because they had chosen to march to war. The Maryland inhabitants who met them had not made that choice. Some rose to the challenge and demonstrated remarkable courage; others exhibited extraordinary foolishness or greed. Whatever their experiences may have been, their stories—told for the first time in Too Afraid to Cry—are no less important that those of the soldiers who marched through their cornfields, and are essential to a full understanding of the Civil War. This book contains numerous period photos and illustrations, detailed author's preface, and extensive footnotes, bibliography, and index. Originally released as a hardcover, it is now available as a 320-page softcover book. 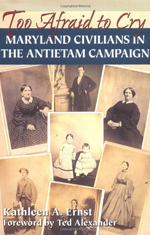 "Too Afraid to Cry captures the saga of those Marylanders who left to fight and the civilians who stayed behind -- only for war to come to them." “Ernst demonstrates some fine literary touches that elevate this beyond a mere retelling of old stories. An exceptional bibliography and detailed endnotes attest to the depth of research." At the request of the Antietam National Battlefield Park, Kathleen Ernst provided a signed, personalized, hardcover copy of Too Afraid to Cry for the time capsule the park buried in 2012—to be opened in fifty years on the 200th anniversary of the battle. Read the author's insights about the book, people, and settings. You can buy signed, hardcover copies of this book directly from the author. Request a quote by clicking HERE. I grew up in the border state of Maryland, surrounded by Civil War battlefields. At that time most programs and books focused on the soldiers’ experiences, but I couldn't help wondering what had happened to the people living in the old homes still gracing the area. For the next decade I scoured libraries and archives and private collections, looking for anything that shed light on the civilian experience during the war. What emerged was a mosaic of stories about women, children, and men who endured through a dreadful time. I wrote this book because I believe those stories must be preserved and shared. I hope they touch your heart as they have touched mine. Kathleen had the honor of being invited to speak at the Antietam National Battlefield near Sharpsburg MD during their 150th anniversary ceremonies commemorating what is now called "the bloodiest day in American history." She spoke about what happened to the civilians who found themselves engulfed in the fighting. 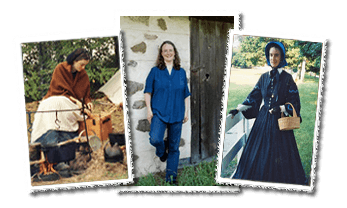 Their experiences form the basis for Too Afraid to Cry, as well as for two of her children's historical fiction books: The Bravest Girl in Sharpsburg, and The Night Riders of Harpers Ferry. You can watch the C-SPAN coverage of her talk at the 150th anniversary ceremonies by clicking on the image below. NOTE: Just before she began, Kathleen was surprised to learn she wouldn't be able to use the slides she had made, and her talk would be covered live by C-SPAN. Watch the video to see how she coped. 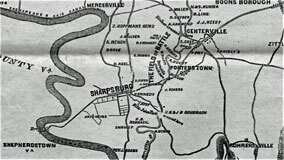 Click on the image below to see a larger version of this 1862 map showing the area around Sharpsburg, Maryland, including "THE FIELD of BATTLE."